Did you receive either of the following in your mail? If so, use the information below to learn more about what we are doing in your neighborhood. 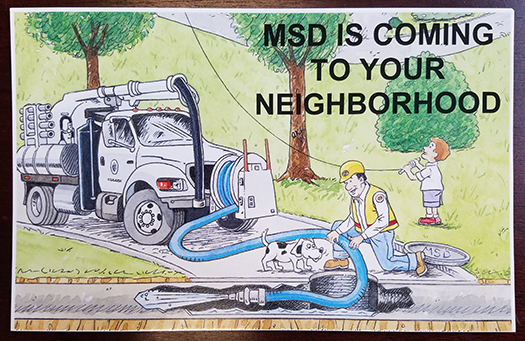 MSD will be performing general sewer line cleaning in Basin 58 starting March 2019 through May 2019, as marked on the map. During this time, you should see no interruption in normal sewer service. If you have any questions, please contact MSD. Thank you. Click here for information on the process of Smoke Testing. Click here for information on the process of Dye Testing. Click here for information on SL-RAT (Sewer Line Rapid Assessment Tool). This is a four minute YouTube video used by permission. MSD will be performing SL-RAT inspection in Basin 48 starting February 2019 through April 2019, as marked on the map. During this time, you should see no interruption in normal sewer service. If you have any questions, please contact MSD. Thank you.